"Think about it: There is no experience you've had that you were not at the absolute center of." 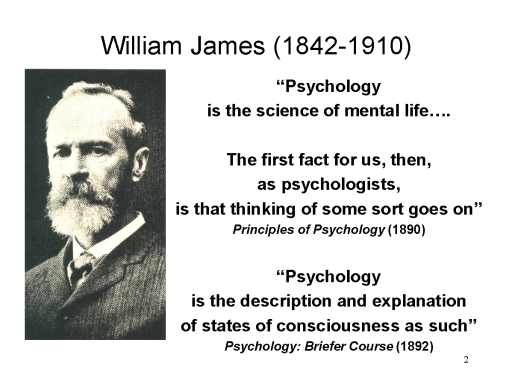 William James famously defined psychology as "the science of mental life" (Principles of Psychology, 1890), expressly concerned with "the description and explanation of states of consciousness as such" (Psychology: Briefer Course, 1892). That's where we began this course, and that's what we've come back to. "Thought is in Constant Change. I do not mean necessarily that no one state of mind has any duration -- even if true, that would be hard to establish. The change which I have more particularly in view is that which takes place in sensible intervals of time; and the result on which I wish to lay stress is this, that no state once gone can recur and be identical with what it was before." "Thought is Sensibly Continuous. I can only define 'continuous' as that which is without breach, crack, or division.... The only breaches that can well be conceived to occur within the limits of a single mind would either be interruptions, time-gaps during which the consciousness went out altogether to come into existence again at a later moment; or they would be breaks in the quality, or content, of the thought, so abrupt that the segment that followed had no connection whatever with the one that went before.... Consciousness, then, does not appear to itself chopped up in bits.... It is nothing jointed; it flows. A 'river" or a 'stream' are the metaphors by which it is most naturally described. In talking of it hereafter, let us call it the stream of thought, of consciousness, or of subjective life." For James, consciousness is a continual flow of mental activity. Just as one never steps in the same river twice, one never has precisely the same mental state twice. A state of consciousness cannot be recaptured; it can only be remembered. In a sense, all introspection is retrospection. "[Consciousness] Welcomes and Rejects, or Chooses, All the While It Thinks. The phenomena of selective attention and of deliberative will are of course patent examples of this choosing activity.... [T]he mind is at every stage a theatre of simultaneous possibilities. Consciousness consists in the comparison of these with each other, the selection of some, and the suppression of the rest by the reinforcing and inhibiting agency of attention. The highest and most elaborated mental products are filtered from the data chosen by the faculty next beneath, out of the mass offered by the faculty below that, which mass in turn was sifted from a still larger amount of yet simpler material, and so on." 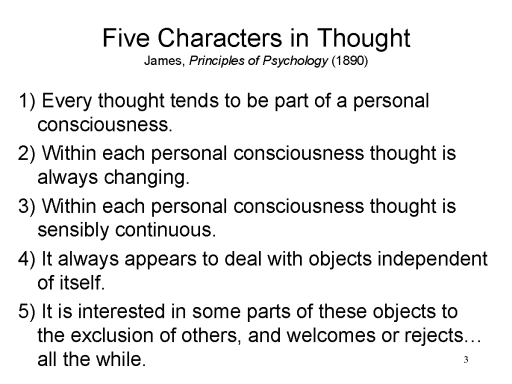 From James onward, and maybe before James as well, it has been popular to identify consciousness with attention. Attention brings objects with the scope of consciousness. We can pay more or less attention to objects, being more or less conscious of them. And sometimes a mental process becomes automatized, so that we don't attend to it at all, and it is performed unconsciously. "Human Thought Appears to Deal with Objects Independent of Itself. That is, it is cognitive, or possesses the function of knowing.... The judgment that my thought has the same object as his thought is what makes the psychologist call my thought cognitive of an outer reality…. A mind which has become conscious of its own cognitive function, plays what we have called 'the psychologist' upon itself. It not only knows the things that appear before; it knows that it knows them. This stage of reflective condition is, more or less explicitly, our habitual state of mind." Here's where I start having problems. Recall that Brentano (1874) held that "intentionality is the mark of the mental" -- by which he meant that mental states are representational, they are always about something. John believes that it is raining outside. John knows that it is raining outside. Propositions have truth value -- that is to say, they are either true or false. It is true that it is raining outside. It is not true that it is raining outside. John took an umbrella because he believed that it was raining outside. John wore a raincoat because he knew that it was raining outside. For Searle (1983), "intentional states are the means by which our minds relate us to the world". They specify a proposition about the world, which either has truth value or has conditions under which it would be true; and they also specify some relationship between the person and the proposition. Do intentional states cause actions? Or are they epiphenomenal? Can nonhuman animals have intentional states? Can you have consciousness without intentionality? Can intentional states be unconscious? But do intentional states always involve propositional attitudes? In the statement John believes that pizza is round, the proposition is that pizza is round, and the attitude is one of belief. In the statement John sees a pizza, there's no proposition -- unless, of course, the implied proposition is John believes that he sees a pizza. But that's not exactly John's mental state. He doesn't believe he's seeing anything -- he just sees it. Again, you can say something like John believes that he likes pizza -- but that's just the same sort of cognitive constructivism that holds that emotional states are derived from cognitive states. Again, it's not clear that John believes anything of the sort -- he just likes pizza. Of course, sometimes it's true that John feels angry because the President declared war under false pretenses -- and there you'd have some propositional content to relate to. But sometimes, John just feels angry. And again, you can say something like John believes that he wants a pizza, which just applies cognitive constructivism to motivation. Or, you could grant motivation some independence from cognition, and simply say that John wants a pizza, and when John wants a pizza, a hamburger or a Snickers bar just won't do. And of course, again, sometimes it's true that John is hungry for a burrito -- and again, there you would have some propositional content to relate to. But sometimes, John's just hungry. The point of this is that it's not clear (to me, anyway) that conscious states always entail propositions and truth conditions. If they don't, then intentionality isn't "the mark of the mental" after all. Implicit memories are representations of events in the past. Implicit percepts are representations of events in the current environment. So what is the "mark of the conscious", so to speak, as opposed to unconscious mental states? "Thought Tends to Personal Form. [E]very thought is part of a personal consciousness.... In this room -- this lecture-room, say -- there are a multitude of thoughts, yours and mine, some of which cohere mutually, and some not…. My thought belongs with my other thoughts, and your thought with your other thoughts. Whether anywhere in the room there be a mere thought, which is nobody’s thought, we have no means of ascertaining, for we have no experience of its like. The only states of consciousness that we naturally deal with are found in personal consciousnesses, minds, selves, concrete particular I’s and you’s [sic]. Each of these minds keeps its own thoughts to itself. It seems as if the elementary psychic fact were not thought or this thought or that thought, but my thought, every thought being owned.... Neither contemporaneity, nor proximity in space, nor similarity of quality and content are able to fuse thoughts together which are sundered by this barrier of belonging to different personal minds. The breaches between such thoughts are the most absolute breaches in nature. On these terms the personal self rather than the thought might be treated as the immediate datum in psychology. The universal conscious fact is not 'feelings and thoughts exist', but 'I think' and 'I feel'." Pierre Janet (1907) had a similar insight, based largely on his clinical studies of hysteria. "There are then in the 'I feel', two things in presence of each other: a small, new psychological fact, a little flame lighting up -- "feel" -- and an enormous mass of thoughts already constituted into a system -- 'I'. These two things mingle, combine; and to say "I feel" is to say that the already enormous personality has seized upon and absorbed that little, new sensation which has just been produced. The complete consciousness which is expressed by the words, 'I see, I feel a movement', is not completely represented by this little elementary phenomenon [i.e., of a sensation of vision or of motion]. It contains a new term, the word 'I', which designates something very complicated. The question here is of the idea of personality, of my whole person...."
And so did Claparede (1911), based on his experience with an amnesic patient -- one of the earliest observations of what we now recognize as implicit memory. "If one examines the behavior of such a patient, one finds that everything happens as though the various events of life, however well associated with each other in the mind, were incapable of integration with the me itself." I believe that it is raining outside. Paraphrasing James, on these terms self-reference rather than intentionality might be treated as the essential ingredient for consciousness. In a series of papers that began in 1984, my colleagues and I have argued that, from a cognitive point of view, the self is simply one's mental representation of oneself -- a knowledge structure stored in memory, activated by experience and thought, and residing in working memory, where it can make contact with other knowledge structures activated by perception, memory, and thought. Perception-based representations, which encode analogical knowledge about objects and events -- their physical appearance, and their spatial and temporal relations with other objects and events. 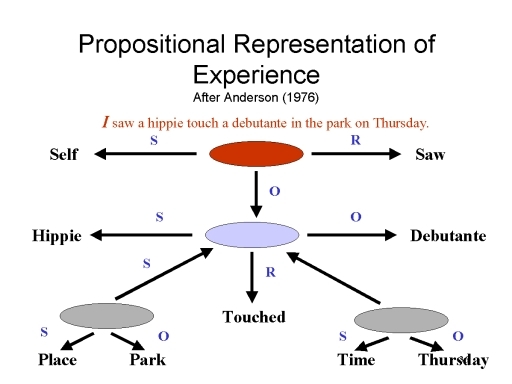 Meaning-based representations, which encode propositional (verbal) knowledge about objects and events -- their meaning, and their semantic relations with other objects and events. The perception-based mental representation of the self is what we mean by the self-image -- which, on the cognitive interpretation, means much more than mere self-esteem. 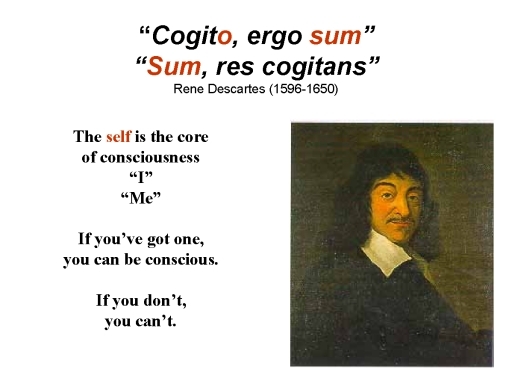 The meaning-based mental representation of the self is what we mean by the self-concept -- which, again, on the cognitive interpretation, means much more than mere self-esteem. Procedural knowledge, concerning motor and cognitive skills (knowing how). Declarative knowledge, concerning facts about objects and events in the world (knowing that). The self is one such object. Therefore, knowledge about the self is declarative knowledge. On this view, procedural knowledge -- knowing how -- is not part of the self. However, one can know that one knows how -- and this metacognitive knowledge, in declarative format, can be part of the self. Episodic memory, essentially autobiographical memory, recording events and experiences. Semantic memory, essentially the "mental lexicon", recording abstract, generic knowledge about objects and events in general. Episodic self-knowledge, or knowledge of the particular events one has experienced and the things one has done. This is essentially one's record of autobiographical memory. Semantic self-knowledge, or more abstract, generic knowledge about one's physical, psychological, and sociocultural characteristics -- plus, of course, metaknowledge about procedural knowledge. The names of significant others, and one's relationship with them (I am married to Lucy). I recognize my own face when I see it in photographs, and my own voice when I hear it on tape. I have a mental images of the rest of my body as well -- literally, my body image. This declarative self-knowledge has truth value, but it is not necessarily accurate. I may believe that I can drive a standard-shift car competently, but my wife might disagree. Individuals with eating disorders often have distorted body images; there is also a psychiatric syndrome known as body dysmorphic disorder, which also involves a distorted self-image. As a concrete example of the role that self-reference plays in consciousness, consider James' analysis (again, as always, in the Principles of conscious memory. "Memory proper, or secondary memory as it might be styled , is the knowledge of a former state of mind after it has already once dropped from consciousness; or rather it is the knowledge of an event, or fact, of which meantime we have not been thinking, with the additional consciousness that we have thought or experienced it before." Note: "Secondary memory" was James' term for what we now call long-term memory. "Primary memory" was his term for what we now call short-term or working memory. The term primary memory was re-introduced by Waugh and Norman in 1965, but has since largely been replaced by the other terms (though I still use it). Memories are represented in an associative network with nodes representing concepts, and links representing the relations between concepts. These nodes are latent until activated by perception or thought. When activated above a certain level, they become part of working memory. For Anderson, working memory is not a separate memory system from long-term memory. Working memory is simply that portion of memory which is activated at any particular point in time -- it is the memories that are being worked on at that moment. For Anderson, working memory is essentially conscious memory; the rest of declarative memory is more or less preconscious. 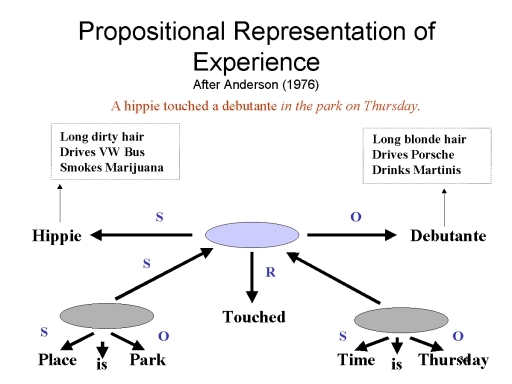 Declarative memories can be represented in propositional format, and all propositions consist of nodes specifying a subject (in this case, the hippie), an object (the debutante), and the relation between them (touching). Procedural memories are represented as "If-Then" productions, and all productions consist of nodes specifying a goal, a condition, and an action that will achieve the goal. For example, If I'm already in first gear, and I want to shift into second gear, Then I have to press down on the clutch. When the condition and goal nodes are simultaneously active in working memory, the action is executed automatically. Note that the condition and goal nodes are declarative memory structures. As such, they enter conscious awareness when activated in working memory. But the action itself is not a part of working memory. As such, it is performed unconsciously. Unlike declarative memories, which can be known directly, procedural memories can be known only by inference. 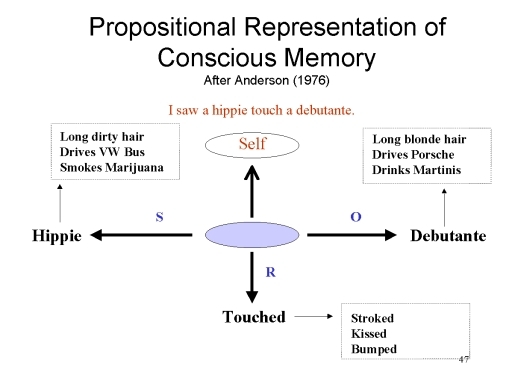 Each of these nodes is also associatively linked to other nodes in the network representing related knowledge stored in memory -- that hippies smoke marijuana, debutantes drink martinis, and touching is a form of contact, as is kissing. 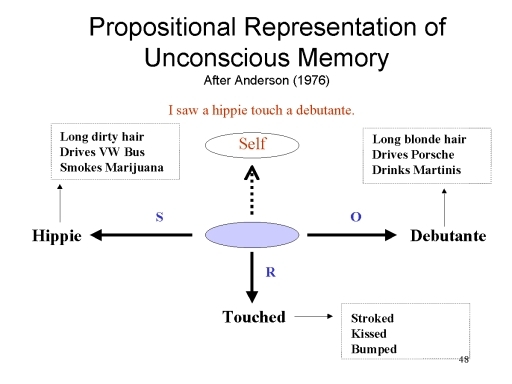 The node representing the entire proposition the hippie kissed the debutante is encoded in memory when the Subject, Object, and Relation nodes are simultaneously activated in working memory. This activation can spread to related nodes in the associative network, activating them as well. Retrieval occurs when one node is activated by perception or thought. If activation spreads to the other nodes, the entire proposition will be retrieved. So, for example, presentation of the cue hippie will retrieve the rest of the proposition, touched the debutante. Residual activation of nodes in the associative network serve as the basis for priming effects. In response to the cue hippie, a subject will be primed to think of Volkswagen. In response to the cue debutante, a subject will be primed to think of Porsche. So how do we make episodic, or autobiographical, memories out of this stuff? "The first element which such a knowledge involves would seem to be the revival in the mind of an image or copy of the original event.... [But] a farther condition is required before the present image can be held to stand for a past original. That condition is that the fact imaged be expressly referred to the past, thought as in the past…." In order to qualify as an episodic memory, this event has to be related to the past. It also needs a particular episodic context. Two events cannot occupy the same time place at the same time, so some more or less particular reference to the spatiotemporal context in which it occurred is necessary to distinguish one event from another. But The hippie touched the debutante is still not an episodic memory -- not really. There's nothing to distinguish this memory from a piece of declarative knowledge like Columbus discovered America, which I definitely did not personally experience. "But even this would not be a memory. Memory requires more than the mere dating of a fact in the past. It must be dated in my past. In other words, I must think that I directly experienced its occurrence. It must have that "warmth and intimacy"... characterizing all experiences "appropriated" by the thinker as his own.... "A general feeling of the past direction in time, then,a particular date conceived as lying along that direction, and defined by its name or phenomenal contents, and imagined as located therein, and owned as part of my experience, -- such are the elements of every act of memory." So in order to qualify as an autobiographical memory, it also needs to be related to self. There has to be a subject, and the subject has to be couched in the first person -- I or me. as in I gave a present to Lucy. as in I received a present from Lucy. as in I love Lucy. as in I am loved by Lucy. I saw the hippie touch the debutante. I was the hippie who touched the debutante. I was the debutante whom the hippie touched. And, in fact, self-reference can be expanded to represent the internal, psychological context of an event, as well as its external, spatiotemporal context. I was amused when the hippie touched the debutante. When the hippie touched the debutante, I wanted to rescue her. Etc., etc., and so forth. [C]onscious states exist only when they are experienced by a human or animal subject. They have a type of subjectivity that I call ontological subjectivity. Another way to make this same point is to say that consciousness has a first-person ontology. It exists only as experienced by a human or animal subject and in that sense it exists only from a first-person point of view. When I know about your consciousness, I have knowledge that is quite different from the kind of knowledge I have of my own consciousness (from Mind: An Introduction, pp. 134-135). Put another way: Consciousness comes when we inject ourselves into our experiences, thoughts, and actions -- take possession of them, and acknowledge them as our own. The loss of consciousness entails a loss of our sense of self, or the loss of our sense of connection to ongoing mental activity. Picking up on this last point, self-reference seems to be the critical ingredient distinguishing a conscious (explicit) from an unconscious (implicit) memory. What words do you recall from the list? Do you recognize any of these words from the list? In conscious recollection, what the subject remembers is that he or she him- or herself was the agent or patient of some action, or the stimulus or experiencer of some state. What word starts with ash___? In a conscious memory, the self is represented in the memory, as the agent or patient of the action, or as the stimulus or experiencer of the state, which constituted the event being remembered. But in an unconscious memory, self-reference is absent. The other elements of the event may be present, more or less, but the self is not among them. Note that in either case, activation can spread from, event nodes to other nodes, generating priming effects. 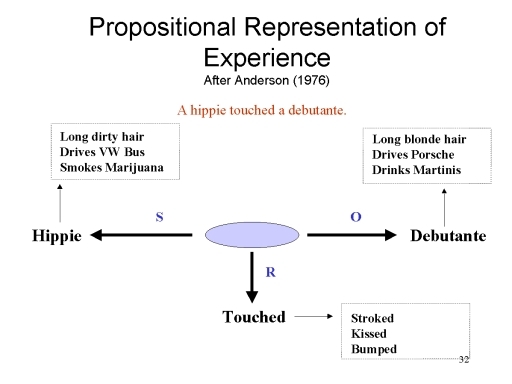 Having observed a hippie touch a debutante (or having studied the sentence) the subject is more likely to think of Volkswagens when cued with the word hippie, and of martinis when cued with the word debutante. These priming effects do not entail self-reference, so they occur whether the self is represented in the memory or not. This is what we mean when we say that priming is independent of conscious recollection. Before the term "implicit memory" was coined, Endel Tulving (1983) referred to such memories as "free radicals", a term in chemistry referring to an atom which has at least one electron unpaired with a proton. The idea was that they weren't connected to anything else in the memory network. But of course they are. They just aren't connected to the mental representation of self. We can extend the role of the self beyond explicit and implicit memory, to other domains of mental life. First, consider perception. In Marcel's classic experiments, the word doctor was presented tachistoscopically, followed by a mask. The experimenter asks the subject, "What did you see?". And the subject replies, "I didn't see anything". Then the experimenter presents a string of letters such as nurse, and asks the subject, "Is that a word?". And the subject replies, "Yes, it is". Now consider thought. In Shames' experiments, the triad playing credit report was presented on a computer screen. The experimenter said, "Can you think of a word these words all have in common?" And the subject replied, "No, I can't". Then the experimenter presented a string of letters such as card, and asks the subject, "Is that a word?". Now, consider emotion. We can imagine an experiment (unfortunately, it hasn't been carried out yet) in which a snake is placed on a table in front of a snake-phobic patient who has successfully completed a therapeutic program of systematic desensitization. The behavior therapist asks the patient, "Are you afraid of the snake?". And the patient replies, "No, I'm not". But the therapist has also been recording the patient's blood pressure, and says, "It's interesting that your blood pressure has gone up". The patient replies, "Huh! So I see. Maybe I'm still afraid of snakes after all". And finally, consider motivation. Following McClelland and Weinberger, we can imagine a personnel evaluation in which an examinee completes a self-report questionnaire concerning achievement motivation. One questionnaire item is "I enjoy playing challenging games such as chess". The examinee responds "No, I don't, not particularly." Then the examinee is asked to write stories in response to TAT cards. The examiner, evaluating the stories, says "It's interesting that these stories contain a lot of achievement imagery". The examinee replies, "Huh! They certainly do". Maybe I'm more interested in achievement than I thought I was". Is There an Unconscious Self? On this view, there is no unconscious self-knowledge -- that is, some part of the self that is unavailable to conscious awareness. If you're aware of some aspect of yourself, that feature can become part of your mental representation of yourself; if something is part of your mental representation of yourself, it is by virtue of the fact that you're aware of it. Now, there may be some aspect of yourself of which you are unaware -- that, for example, you're an annoying little person and everyone who knows you despises you. But those facts cannot be part of your self-concept, because you're not aware of them; once you become aware of them, then they are eligible to be incorporated into your self-concept. To take a more serious example, there was a time in their adult lives that neither Madeleine Albright, President Clinton's UN Ambassador and later Secretary of State, or John Kerry, the Democratic candidate for President in 2004, knew that they were of Jewish heritage. Before they found out, that information could not have been part of their respective self-concepts. But once they became aware of it, that feature was available to be incorporated into their mental representations of self. This is why procedural knowledge can't be part of the self: procedural knowledge is unconscious in the strict sense of the term, and is known only by inference from performance. 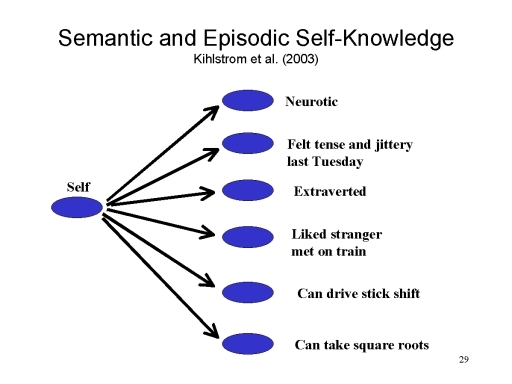 However, metacognition -- declarative knowledge about procedural knowledge -- can be incorporated into the self. I know that I know how to tie a necktie into a Windsor knot -- and that declarative knowledge, is available to be incorporated into my self-concept. There is a partial exception to the rule against unconscious self-knowledge. The dissociative disorders are forms of mental illness characterized by disruptions in conscious memory and identity. In dissociative amnesia, the patient cannot consciously recollect certain events, though memory for these events can be expressed implicitly. But he still retains his normal sense of identity. In dissociative fugue, the patient loses his identity as well as personal memories. But this identity is restored when the fugue state has resolved. So it wasn't permanently lost, but rather rendered temporarily inaccessible to conscious awareness. In dissociative identity disorder, the patient has two or more separate identities, each associated with their own fund of autobiogaphical memories. But the patient's conscious identity can shift back and forth between (among) the alter egos, each one receding into unconsciousness as another comes forward. So, in this sense, at least, it is possible to have an unconscious self. This analysis has focused on James (not to mention Anderson's hippie and debutante), but the essential insight was right there in Descartes all along. This page last revised 08/11/2014.